This manual is for individuals wishing to become certified in commercial pesticide applicator category 1A, Agricultural Weed Control. This manual is for individuals planning to become certified in commercial pesticide applicator Category 1B, Agricultural Insect Management. 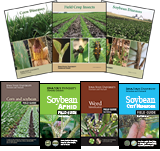 This manual can help you become certified in commercial pesticide applicator Category 1C, Agricultural Crop Disease Management. To become certified in commercial pesticide applicator category 1D, study the information in this manual prior to your certification examinations. This manual is for individuals planning to become certified in commercial pesticide applicator Category 1E, Animal Pest Control. 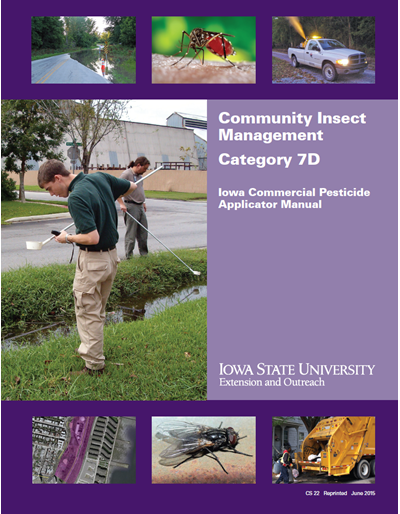 Prepare for Iowa Commercial Pesticide Applicator certification examinations in category 2, Forest Pest Control, by studying this manual. Full color photos used throughout. This manual has been developed for individuals who want to become certified in the commercial and public pesticide applicator Category 3 – Ornamental and Turfgrass Pest Management. 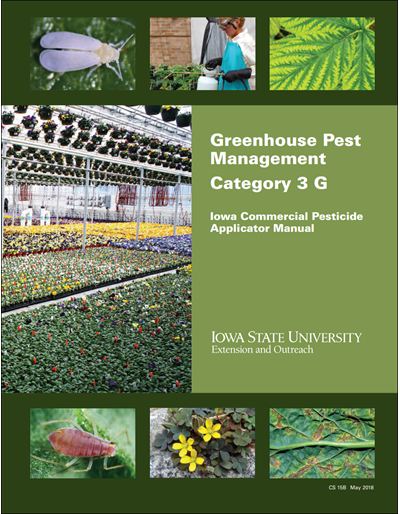 The newly revised Category 3 Ornamental and Turfgrass Manual, CS15A, covers the plant pathogens, insects and mites, weeds, and vertebrates common in Iowa’s ornamental and turfgrass settings, and the various strategies used in managing these pests. 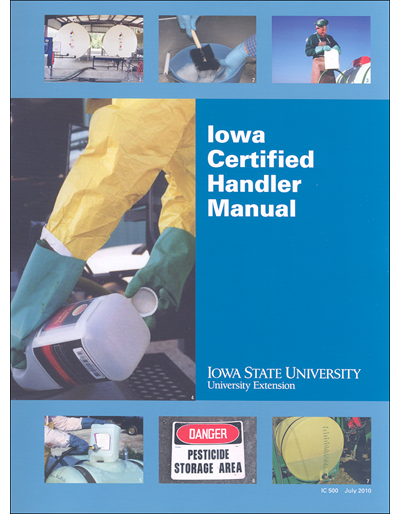 The manual was written with full input from subject matter experts across Iowa. Complete with four-color pictures and detailed pest information, this descriptive work will not only assist persons in preparing to take the Category 3T (Turfgrass), 3OT (Ornamental and Turfgrass), or 3O (Ornamental) certification examination(s), but will also serve as a reference for applicators and industry support personnel. 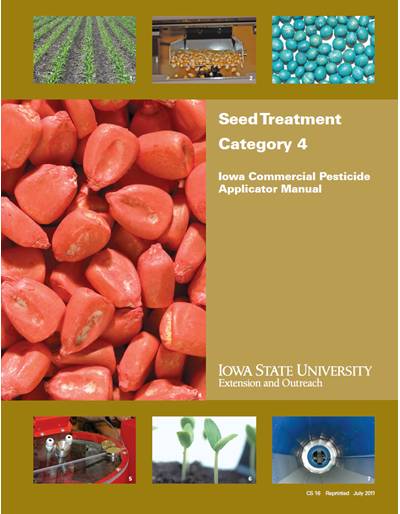 This manual is for individuals planning to become certified in commercial pesticide applicator Category 4, Seed Treatment. 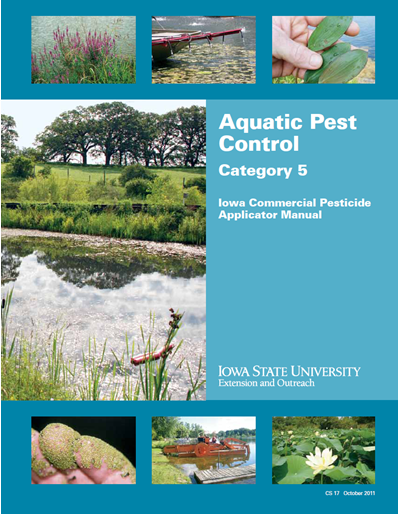 Prepare for certification examinations in category 5, Aquatic Pest Control, by studying this manual. Full color images used throughout. 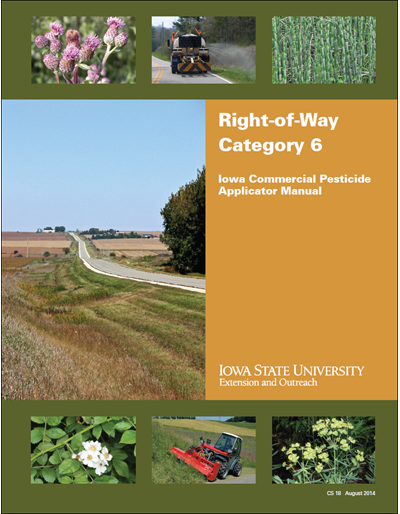 The newly revised Right-of-Way Category 6 manual is available for Iowa's commercial and public pesticide applicators. The 98 page manual covers the noxious weeds and other weed species common in Iowa's right-of-way environments and the various strategies used in managing these weeds. 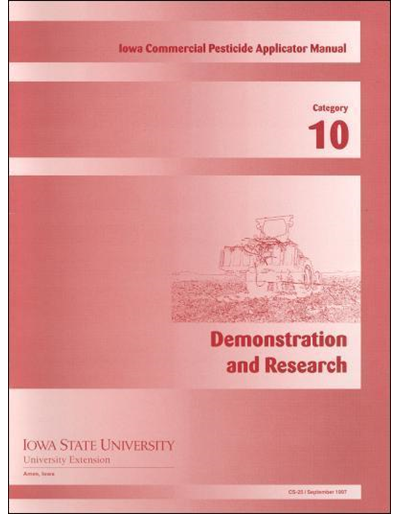 The manual was written with full input from subject matter experts across Iowa. Complete with four-color pictures, this descriptive work will not only assist persons in preparing to take the Category 6 examination, but will also serve as a reference for applicators. 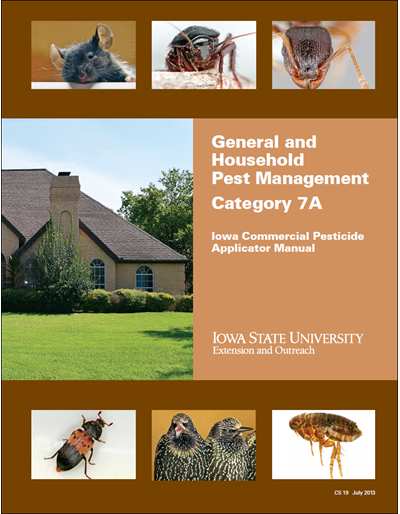 To be certified in commercial pesticide applicator category 7A, or as a pest control operator, food plant sanitarian, or otherwise be responsible for the management and elimination of household pests use the information in this manual to study prior to your certification examinations. 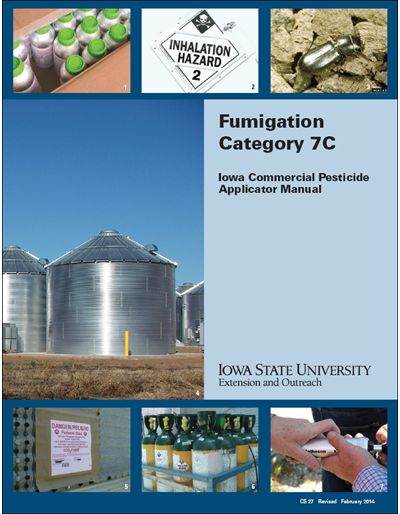 To become certified in commercial pesticide applicator category 7B, Termite Control, study the information in this manual prior to your certification examinations. 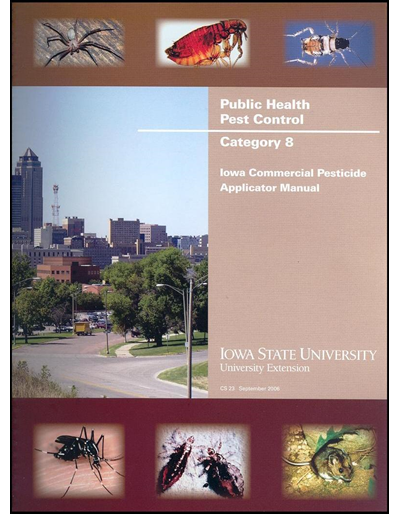 To become certified in commercial pesticide applicator category 8, Public Health Pest Control, study the information in this manual prior to your certification examinations. This manual is for individuals wishing to become certified in commercial pesticide applicator Category 9, Regulatory Pest Control. This manual is for individuals wishing to become certified in commercial pesticide applicator Demonstration and Research, Category 10. Aerial Application supplements the Iowa Core Manual and covers the topics of pesticide laws and regulations, application equipment, calibration, field operations, proper handling and use, and drift. This manual is for individuals wishing to become certified as a private or commercial applicator in Fumigation, Category 7C. Prepare for certification examinations in category 7E, Wood Preservation, by studying this manual. Full color photos used throughout. This category manual supplements information in the Iowa Core Manual, CS 445, which also should be used for certification preparation. 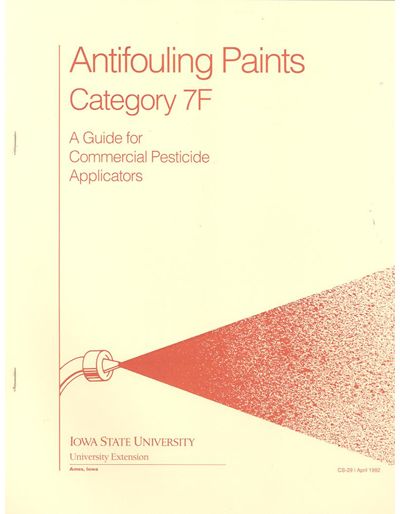 Handle and apply pesticides in a safe and efficient manner with the help of this guide for using tributyltin (TBT) paint. 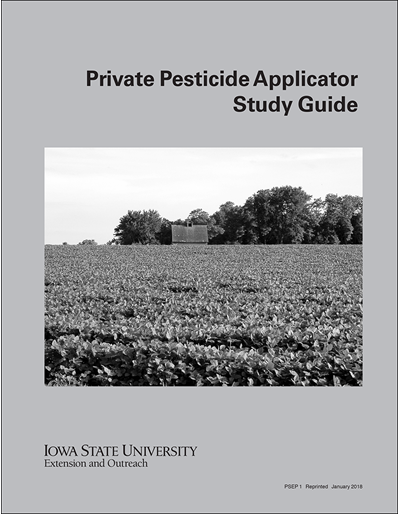 This certification manual is intended to provide the "core" or basic understanding of safe and responsible pesticide use needed to successfully pass the Iowa Core examination for commercial pesticide applicators. 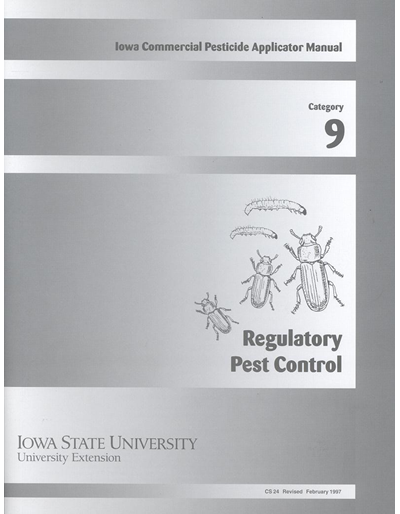 This manual serves as a study guide for the core exam which covers subjects relating to applicable state and federal laws and regulations; pest management; label comprehension; pesticides; safety; the environment; and equipment and application techniques. Purchase as a set - save $5.00 over purchasing individually. 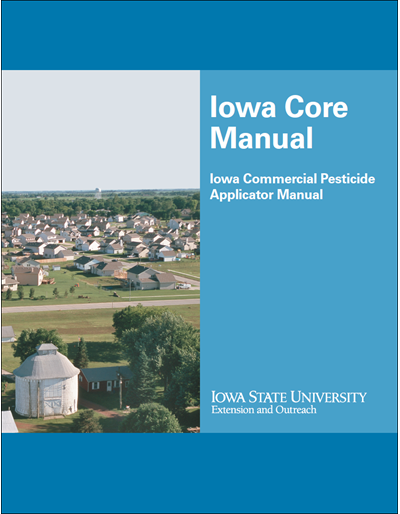 The Core Manual provides information needed to pass the Iowa Core examination for commercial pesticide applicators. This manual is for individuals planning to become a certified handler. Please note: You do not need to refer to any other pesticide applicator manual to prepare for the certified handler exam. 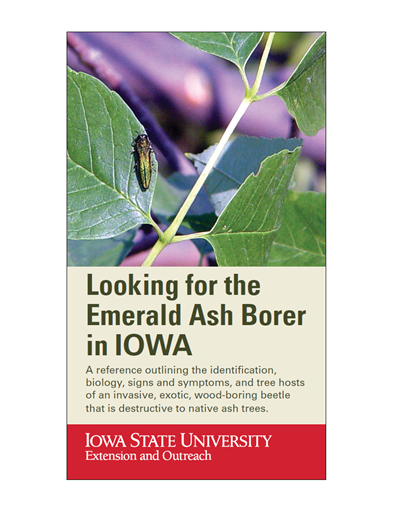 Characteristics and color photos of Emerald Ash Borer and Native Borers are featured in this side-by-side comparison. A reference outlining the identification, biology, signs and symptoms, and tree hosts of an invasive, exotic, wood-boring beetle that is destructive to native ash trees. 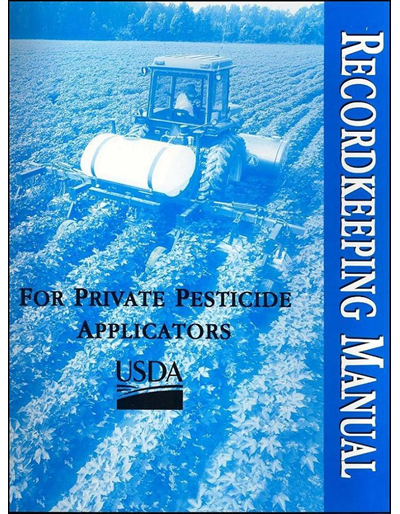 This thorough manual covers information needed for private pesticide applicators. Topics include general information; pesticides and human health; pesticide handling and waste; application equipment and calibration; pesticides in the environment; laws and regulation; and pest, insect, and weed management. 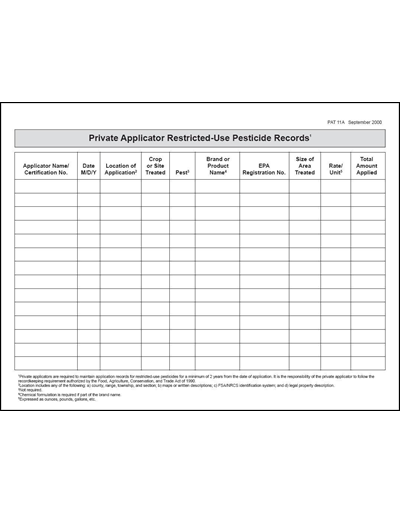 This manual contains forms for recording pesticide use as required by federal regulations. Instructions and requirements for filling out the forms as well as a sample log form are provided. Also includes instructions for accurate sprayer calibration. 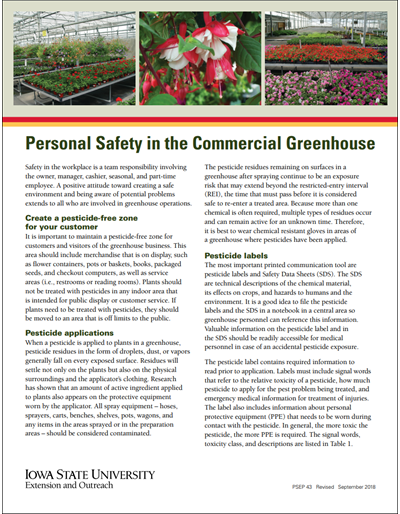 This publication provides information about safety and personal protective equipment that will foster a safe work environment in commercial greenhouses. Managing pesticide application procedures to minimize pesticide exposure of applicators and other workers is important. Find out how you can reduce pesticide contamination of water — whether you're treating a corn field, a lawn, or a building structure. You'll know more about Iowa watersheds, runoff, and leaching as well as best management practices to follow. 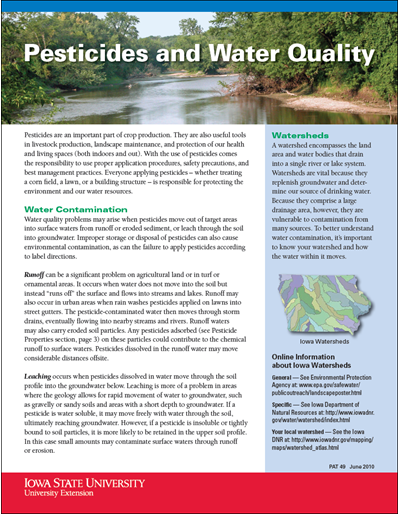 Find management practices that keep pesticides and nutrients in the field and out of Iowa's rivers and streams. Describes how pesticides move through the soil. Includes a checklist of management practices to protect water resources. 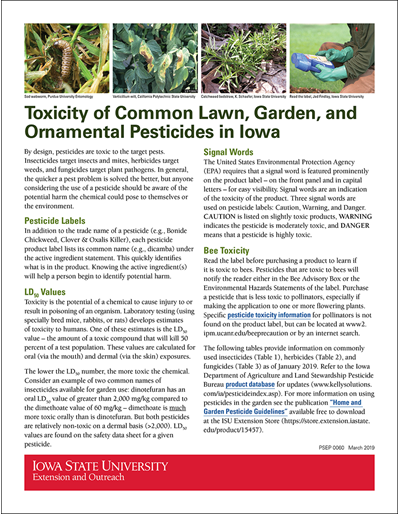 This publication is designed to inform the general public of how to understand labels of pesticide products used to control pests in the landscape or inside buildings. Pesticides can be valuable garden tools, but they must be selected and applied with personal and environmental safety in mind. 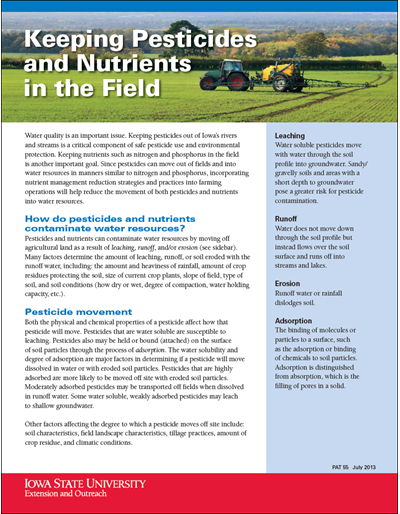 This publication discusses when to use a pesticide, which pesticide is best and how to apply, store and dispose of pesticides safely. Pesticides are toxic to target pests, but can also cause potential harm to the applicator or the environment. This publication discusses how to understand a pesticide label, its toxicity and whether it could be toxic to bees. It also contains table that provide information on commonly used insecticides, herbicides and fungicides.